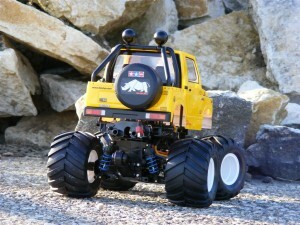 Here it is, the next beautiful addition to the growing line of Tamiya Wheelie cars. The new Suzuki Jimny (SJ30). After the fantastic Volkswagen Type2 bus the next release based on the WR-02 chassis. 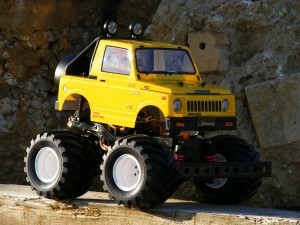 I´ve always loved those little Suzuki Jeeps, and I´m a big fan of the WR-02 , so this Tamiya release was a must have for me. The build was easy. I did the usual changes on the car like full ball bearings, 20 tooth pinion, the new Tamiya 54394 WR-02 Assembly Universal Shaft Set (we hope for more new WR-02 Hop Ups !) and CVA Shocks. Something really new on one of my WR-02´s is a mild sensored brushless setup which should be equal to the Tamiya Sport Tuned motor. We will see how it works on the first run. 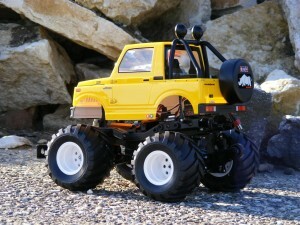 I love the cute look of the little Suzuki body sitting on the short WR-02 chassis. The team of tamiyablog would like to thank the Tamiya Company for another funny little car with another wonderful classic boxart picture after the Volkswagen Type2. GO GO WHEELIE !!!!! 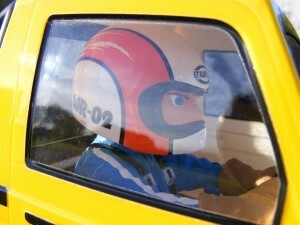 This entry was posted in Reviews on August 12, 2012 by dunebuggy. which motor did you get ? I´m using a Nosram 15,5 Turn 2800kv motor. Normally my favourite motor for the WR-02 is the Tamiya Black Sport Tuned brushed motor combined with a 20T pinion and oil filled shocks. A first test drive showed that the brushless motor has nearly the same power as the Tamiya Sport Tuned motor. Imho you shouldn´t use more than a 3000kv brushless motor in a WR-02. Do you use a Hobbyking x-car 60a esc? 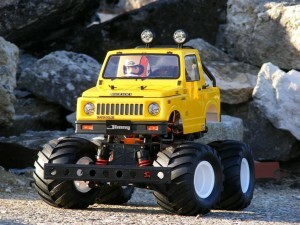 I´m using the Hobbyking 35A Sensored/Sensorless Car ESC, Produkt ID: HK-SENS-35A. The new X-Car 60a esc ist ok too, but the 35A Version is more than enough for this relatively slow car. I wouldn´t recommended brushless motors with more than 3000kv. While using modified motors in a WR-02, the Tamiya 54394 WR-02 Assembly Universal Shaft Set is highly recommended. Any tips for a servo? 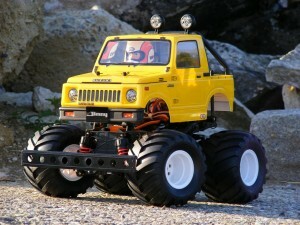 Every high quality standard size servo can be used for the Tamiya WR-02 chassis. It should not be too slow. 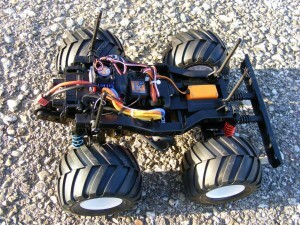 With a fast servo, it´s easier to do the funny maneuvers with this chassis. Think this is ok it too fast? This is ok. It could be a little bit faster. And no need for such a high tourque. 7-9 kg is more than enough for such a car. Oh I see. How’s this? 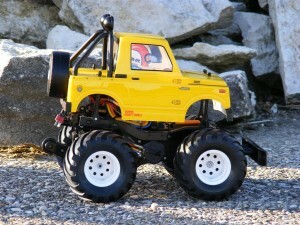 Blue Bird Standard Servo For 1/8, 1/10 Buggy Truggy Crawler. Cool thank you for the help appreciate it.